You may have noticed that my modelling output has been rather limited the last few months. Partly this is because sometimes I do a lot, sometimes I don't. It is a hobby after all, and after the EXPO challenge last year it is nice to not have deadlines. However another factor is that we moved house at the end of last year, and while the new house doesn't need a lot of work, there have been more DIY jobs than usual to content with. 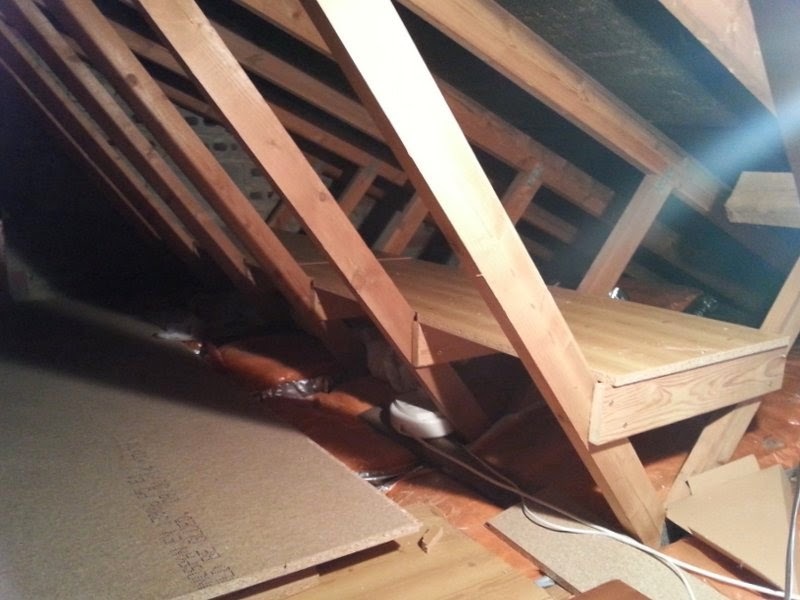 One such task has been to make usable space in the loft. Like many houses built in the last 50-years it has a low-profile roof with pre-fabricated roof trusses, which combined with extra insulation makes the space difficult to access and no use at all for storage. The first task was to make a floor for safe access. Some pieces of chipboard from an old chest of drawers were fixed to the few planks at the top of the ladder, but I didn't want to remove any insulation. So I got some 4"x2" timber from a local timber merchant, who cut it to 4' lengths too, these are then screwed on top of the joists between the insulation and could then support 18mm chipboard flooring. This provides crawling space (no room to stand!) 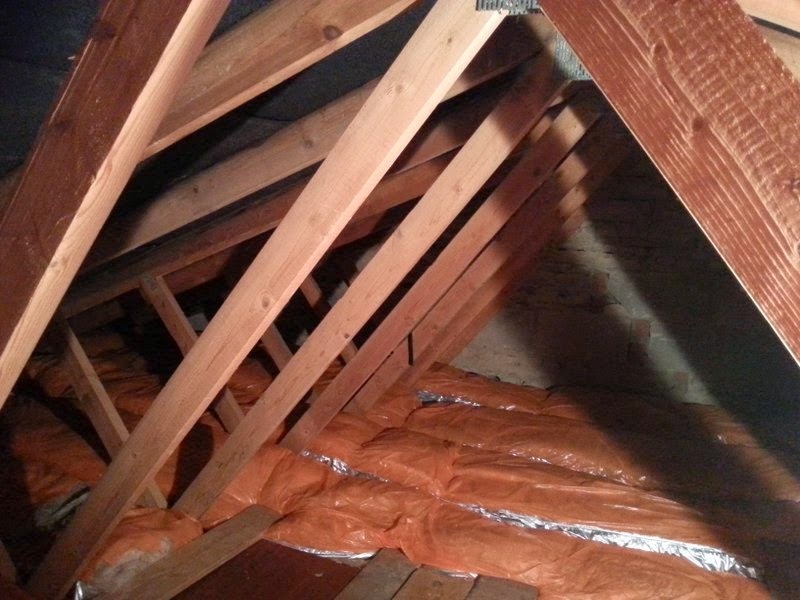 but allows air to move above the insulation. Next up was to provide storage space. 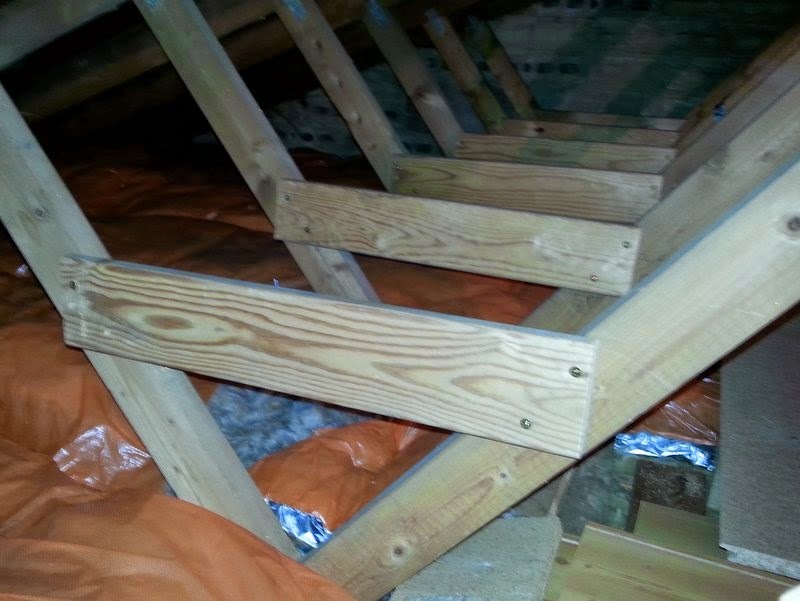 I had a load of old bed slats which were cut and screwed across the outer "vee" of the trusses as seen above. More chipboard recycled from old furniture could then sit on top of these to provide a shelf. The shelf is about 18" deep and the trusses are around 18" apart (though it does seem to vary!). Having just dismantled a built-in wardrobe I have now fitted out about half the loft in this way (the water tank makes the rest of the space more difficult to access). Now I suppose this space could be used for a model railway, but it isn't really ideal. Apart from the temperature variations, poor light, limited space for humans, and the difficulty of getting any layout in or out, it isn't a sociable place to be! Nonetheless it will help by allowing stuff to move out the garage (you know, Christmas decorations, spare bedding, all those railway mags and anything else that probably isn't needed but isn't ready to be thrown away), meaning perhaps one day I'll have enough space there to build a layout! The South Downs 009 group were invited to show a layout at an exhibition at a Methodist Church in Patcham, we thought a small straightforward layout would be easiest so I volunteered Awngate. The organisers had a small but good variety of layouts through a couple of rooms, and provided a very welcoming atmosphere making for an enjoyable day. It did seem very quiet though, it would have been nice to see a few more visitors through. A sneaky view behind the scenes showing the trestles, vital mug-shelf, and the power box hanging beneath. Martin must be concentrating on a shunting manoeuvre, having moved in close for a good look! We ran a couple of mixed trains which needed the wagons shunting, so providing more interest for us though at a higher risk of coupling-stress. Generally things went pretty well though. Behind us was this super HO German layout "Bahnhof Laufenmuhle" by Alan Peacock, which I've admired before. Little Teisleigh in OO by the Brighton Model Railway Group is a GWR branch, with added minerals. This model of the Brighton Volks Electric Railway in G1 is often seen at local shows, the models are very fine and there interesting displays about the prototype, though I think it would be nice if a little more scenery were present as the 36' length is mostly table-top with a track on it. I heard about the Chemin de Fer de la Baie de Somme through an NGRM forum posting, and once we'd decided our holiday this year would be in Northern France I was determined to pay a visit. The meter gauge railways around the Somme estury towns opened in the late 19th centruy and a fair milage has now been preserved. We took the train from St Valery sur Somme to Le Crotoy via Noyelles sur Mer, there is also a branch to from St Valery sur Somme (though not at the same station!) to Cayeux sur Mer. Waiting for us at the quayside station in St Valery is this elegant locomotive with a train of bogie carriages. It's a 230 (or 4-6-0) tank engine built by Cie de Fives-Lille in 1909, quite a big powerful beast. It seems we picked a bank-holiday weekend to visit and the trains were crowded, parking was a nightmare, and they really need more than one toilet at the station! A couple of hundred yards down the line we passed the "town" station which serves the branch to Cayeux sur Mer. It is timetabled to be run by railcar or diesel but, perhaps due to the bank holiday crowds, this delightful 2-6-0T (130 in French!) Corpet built in 1906 was on duty. Noyelles is the junction with the SCNF main line, and also the mid-point passing station of the line from St Valery to Le Crotoy. It is also a terminus, and trains from both ends of the line reverse here. Looking back as we left the train to St Valery can be seen departing over the scissors crossover, the tracks run parallel for a few hundred yards. The far right track is dual gauge, standard gauge rails straddle the meter gauge, this runs all the way from Noyelles to St Valery. At Le Crotoy the loco takes on water by the shed at the end of the line. The main depot and workshops are just outside St Valery, but the trains start from both ends. Leaving Noyelles on the return journey the two trains, having reversed in the station, depart in turn then the second overtakes the first. This appears to be "stage managed" to allow passengers to see the other train, and just for the fun of it! The locos have swapped trains during the proceedings, perhaps to get back to the correct shed for the night? Back at St Valery the loco is turned on the inset turntable on the quayside, in front of the station building, which also acts as the release to the loop. The turntable is electrically operated from a control panel (near the parking meter on the left). I don't really know why they bother though as this is the only turntable on the line! This loco is a Buffard 031 (0-6-2) of 1910, and was designed to run cab-first for visibility on and by the road. Despite the crowds we had a great trip, the locos and coaches are beautifully restored and kept, and it's a nice ride. For more pictures check out the album. If you are in the area (it's only an hour from Calais so even possible on a "day trip") this line is well worth a visit.